The area of the original Chancel and Sanctuary was excavated down to the natural clay. Much of the earth above this level had been extensively distributed by the digging of wall foundations of the earlier phases and also grave digging. A thin layer (0.15m) of black earth lying on top of the clay had been less disturbed and it was this and the contents of a pit below it which produced evidence of Late Iron Ages settlement on this site. 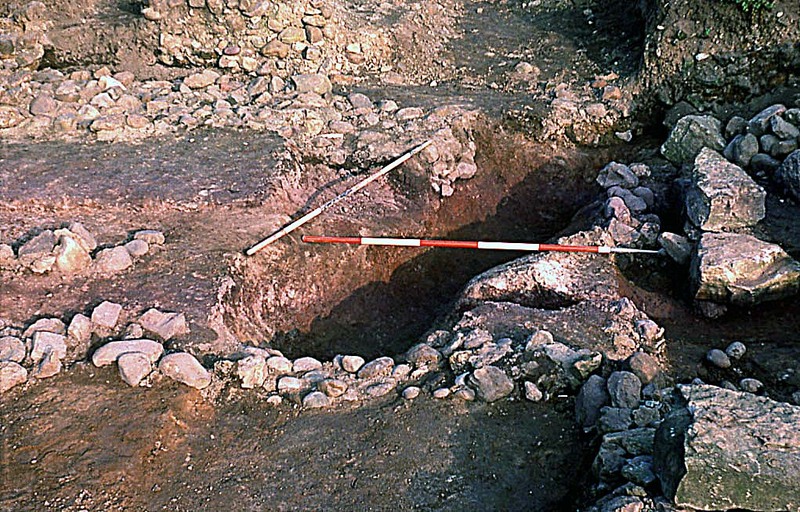 The findings indicate that this site was a late Iron Age occupation that continued from the mid to late 1st century AD. The Langton Down type brooch. This was not reeded which suggested a post conquest date. The pierced catch plate is broken. The date for this brooch is about AD50. In addition late Iron Ages farmers would have been attracted to the excellent site. It is well drained with the land to the north sloping away to a stream 590metres away, whilst to the south lay a level area of fertile land. The find would indicate that this was a well established settlement. Unfortunately little else has been discovered to give greater detail to this stage of the areas development.